Skip the morning drive-thru—make this hearty BOCA Veggie Breakfast Link bagel sandwich at home instead. It tastes better and it's better for you. Microwave link pieces in microwaveable cup sprayed with cooking spray on HIGH 10 sec. Stir in next 3 ingredients; cover with paper towel. Microwave 1 min. to 1 min. 15 sec. or until egg product is almost set, stirring after 35 sec. Let stand 1 min. 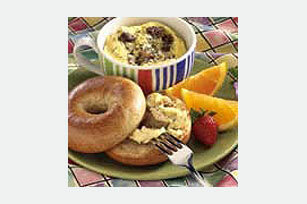 Fill bagel halves with egg mixture. Wrap hot sandwich in foil for a great breakfast sandwich to eat on the run. Substitute 1 beaten egg for the cholesterol-free egg product.